Several websites have been reporting rumors about the new Fuljfilm FinePix Real 3D digital camera. The rumors say that it will be released in September 2009 and cost about $600. 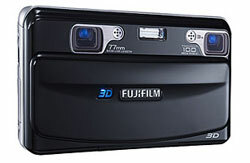 The Fuljfilm FinePix Real 3D looks like an interesting concept with twin lenses that are supposed to produce 3D images. It remains to be seen how good the end results will be and in my opinion the $600 price tag sounds a bit high, but I’m looking forward to see the first pictures from the Fuljfilm FinePix Real 3D camera.